Engineering ToolBox - enabled for use with the amazing FREE SketchUp 3D drawing and modeling program. A shape is classed a "Bar Size Shape" when its greatest dimension is less than 3 inches. It is a "Structural Shape" when at least one of its dimensions is 3 inches or greater. Rotate the screen or widen the window to see full table! NOTE!! - the "insert!" and the Tools features only works when the engineeringtoolbox exension is opened from within SketchUp. Install the extension as described in the right column - restart Sketchup and open this tool from the Sketchup Plugins menu. iso! - top! - front! - right! - left! - back! - bottom! make! - makes a component of the selected object. Note that all objects from the Engineering Toolbox are inserted as individual groups. You should transfer a group to a component sharing the same definition when there is more than one instance of the same object. Tips! Rename the object to its final name before making it a component (in outliner or with right click and entity info). degrees around red, green or blue axis! (select object(s) first). Very handy for objects with curved surfaces like pipes, elbows ..
- move or copy (multiple) selected objects. Make advanced geometric constructions with multiple selections, multiple copies and the offset. Tip! - Use "Make Component" to save space and reduce computer load when working with multiple copies. - inserts a "Knife" to cut in one or more objects. cut! - before cut: customize the inserted Knife! The Knife is a group you can rotate, change the size of, and even add or remove objects within (example - add a function curve for an advanced cut). You can also make your own Knife by naming a group "theKnife". After insert and customizing the knife - positioning it to the object(s) where to cut - select the object(s) (must be groups) - and click cut! Afterwards - select the object(s) and remove the parts of the object(s) that you don't want. YouTube demo of the Knife! move! - select two objects - then click "move" and one of the objects moves to the position and angle of the other object. Handy when moving between axis systems. You can change the position and angle of an inserting object by pre-selecting an existing object before Insert! The inserted object will inherit the position of the selected object. Handy when working with non-default axis. If you don't have Sketchup installed on your computer - download the amazing FREE SketchUp here! Note! - SketchUp Free (the web app) can't use extensions. You need to install the local version of SketchUp Make if you want to use extensions. From within Sketchup - open the Engineering ToolBox extension, navigate to component and select insert! - and the component will be added to your model. From the Sketchup menu - select Window > Extension Warehouse - and search for "Engineering ToolBox" - and install! Restarting Sketchup may be required to activate the extension. Note that this procedure may be different in older Sketchup versions. From the Sketchup menu - select Window > Extension Manager, the button "Install Extension" - and select the downloaded file. 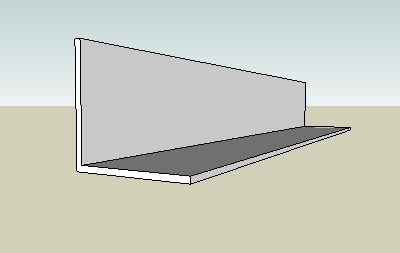 Note that this procedure is different in older Sketchup versions. From the Sketchup menu - select Extensions > Engineering ToolBox. A page like this opens in a separate window - navigate to the wanted component - and select insert! to add the component to your SketchUp model. Note! The SketchUp Engineering Toolbox is an online resource updated continuously. You need an internet connection to operate. For some components parameters like length, color, offset and more can be modified before insertion. Customized components can be inserted by changing parameters in the dialog boxes at the end of the component lists - and clicking "custom!" Selected objects in the model can be manipulated - rotated, moved, colors changed and more - from the Tools section. Assistant objects like lines, horizontal and vertical planes can be added. The most efficient way to learn SketchUp is by watching the tutorial videos. Organize your model in groups - add components to the groups! 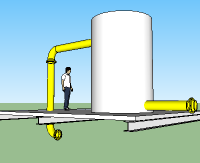 Example: Use separate groups for construction steel, piping, the different HVAC systems and more. Always keep an eye on the model in the "Outliner" window. Use layers to organize and control the visibility of the model. The most convenient way to copy an object is by selecting it, using move or (m) and pressing Ctrl (makes a copy) before moving. Precise moving of a object can be done by selecting a point in the object that can be connected to a point in the new position (like a edge on a component, surface, a midpoint or similar). Be aware that objects from The Engineering ToolBox are inserted in Sketchup as Groups. They will show up in the Sketchup > Window > Outliner dialog but not in the Sketchup > Window > Model Info > Statistics (Only Components) dialog. click The Engineering ToolBox "Make Component"
The objects will now show up in the Sketchup > Window > Model Info > Statistics dialog and be available for reporting through Sketchup > File > Generate Report feature or other third party report generators. An insterted object from The Engineering ToolBox can also be converted to a Component by right clicking the object and selecting Make Component. The name will not be preserved and must be changed after the conversion.